This week's texts are “Down at the Front," “After First Fredericksburg," “Back to Washington"
A year and a half later, Whitman was down at the war front, in Fredericksburg, Virginia, looking after his injured soldier-brother, George, and was now wondering how long this suddenly very bloody quagmire would last. Like most Americans who were not on the battlefields, Whitman spent time each day looking at the growing list of casualties that newspapers printed—the lists of the dead and wounded that, as those lists got longer and longer, became increasingly amputated names, names of the dead that were now forever cut off from the young lives they so recently signified. Mass death came to be, as inevitably it has to, anonymous death. We can’t keep track of the cascading faces and names: think of the vast black slabs of the Vietnam memorial in Washington, D.C., with its endless rows of names. That memorial captures what Americans during the Civil War would have experienced as the newspaper arrived each day, invading their homes with these lists of names now severed from their living identities. It was from just such a list of casualties in the New York Herald that Whitman picked out his brother George’s name, the name itself mangled (“Whitmore” instead of “Whitman”) just like the soldier it indicated, and that led Walt to the Fredericksburg battlefield and changed the course of his life and his poetry. 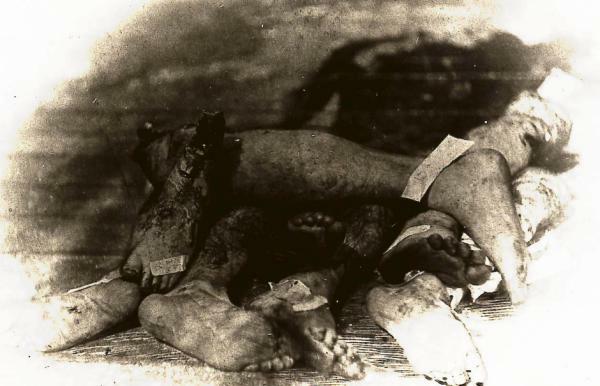 As he arrived and approached the mansion used as a hospital, he passed by “a heap of amputated feet, legs, arms, hands, &c., a full load for a one-horse cart.” It was the first indication he had that this would be a war of amputation, eventually severing an entire generation of American males from the country’s future. That pile of body parts Whitman encountered, like some grotesque parody of his life-affirming poetic catalogs, became the stubborn reality he would have to learn to incorporate in his radically altered post-1860 poetry: now—as we saw in “The Million Dead, Too, Summ’d Up”—instead of celebrating an expanding self and nation and cosmos in his affirmative song, he would begin cataloging mass death and horrifying wounds. For the poet of the body, who believed the soul only existed when it took on flesh and bone, when it gained a body so it could act in the world—for this poet, the war was an attack on the American soul, leaving a generation of American men dead or disfigured. How could the soul of a generation function without legs, the very means of locomotion, of moving in the world, or without hands and arms, the means of doing work in the world? To his relief, Whitman found his brother George with only a minor facial wound. George would heal and go on to take part in many of the key battles of the war, rising to the rank of major and spending time as a prisoner of war in Danville, one of the notorious Confederate prisoner camps. But many of George’s comrades in the Battle of Fredericksburg were badly wounded, and Whitman began caring for them while he was at his brother’s camp: “I go around from one case to another. I do not see that I do much good to these wounded and dying; but I cannot leave them.” Just sitting with them, touching them, holding them, he discovered, provided comfort, and when Whitman took a train back to Washington, he rode with the wounded on their way to the hospitals in the nation’s capital. Whitman found that many of these soldiers wanted him to write letters to “parents, brothers, wives, &c.” At this point, Whitman already had found his calling for the rest of the war. He abruptly gave up plans to return to New York and took up residence in Washington to tend to the endless stream of wounded and dying soldiers who came there. “America,” he wrote to Ralph Waldo Emerson, was “already brought to Hospital in her fair youth”; the nation’s capital and its monumental buildings (many of them, like the Capitol itself, still under construction) were turned into a vast network of hospitals. And, for the next two and a half years, Whitman would occupy those hospitals, caring for soldiers from the North and South and East and West, black soldiers as well as white—the vast variety of the nation’s youth brought to hospital, which for Whitman became the very center, the locus, of the war. FALMOUTH, VA., opposite Fredericksburgh, December 21, 1862.—Began my visits among the Camp Hospitals in the Army of the Potomac. Spent a good part of the day in a large brick mansion, on the banks of the Rappahannock, used as a Hospital since the battle—Seems to have receiv'd only the worst cases. Out doors, at the foot of a tree, within ten yards of the front of the house, I notice a heap of amputated feet, legs, arms, hands, &c., a full load for a one-horse cart. Several dead bodies lie near, each cover'd with its brown woollen blanket. In the door-yard, towards the river, are fresh graves, mostly of officers, their names on pieces of barrel-staves or broken board, stuck in the dirt. (Most of these bodies were subsequently taken up and transported North to their friends. )..........The large mansion is quite crowded, upstairs and down, everything impromptu, no system, all bad enough, but I have no doubt the best that can be done; all the wounds pretty bad, some frightful, the men in their old clothes, unclean and bloody. Some of the wounded are rebel soldiers and officers, prisoners. One, a Mississippian—a captain—hit badly in leg, I talk'd with some time; he ask'd me for papers, which I gave him. (I saw him three months afterward in Washington, with his leg amputated, doing well. )..........I went through the rooms, downstairs and up. Some of the men were dying. I had nothing to give at that visit, but wrote a few letters to folks home, mothers, &c. Also talk'd to three or four, who seem'd most susceptible to it, and needing it. December 23 to 31.—The results of the late battles are exhibited everywhere about here in thousands of cases, (hundreds die every day,) in the Camp, Brigade, and Division Hospitals. These are merely tents, and sometimes very poor ones, the wounded lying on the ground, lucky if their blankets are spread on layers of pine or hemlock twigs or small leaves. No cots; seldom even a mattress. It is pretty cold. The ground is frozen hard, and there is occasional snow. I go around from one case to another. I do not see that I do much good, but I cannot leave them. Once in a while some youngster holds on to me convulsively, and I do what I can for him; at any rate, stop with him and sit near him for hours, if he wishes it. Besides the hospitals, I also go occasionally on long tours through the camps, talking with the men, &c. Sometimes at night among the groups around the fires, in their shebang enclosures of bushes. These are curious shows, full of characters and groups. I soon get acquainted anywhere in camp, with officers or men, and am always well used. Sometimes I go down on picket with the regiments I know best.......As to rations, the army here at present seems to be tolerably well supplied, and the men have enough, such as it is, mainly salt pork and hard tack. Most of the regiments lodge in the flimsy little shelter-tents. A few have built themselves huts of logs and mud, with fireplaces. WASHINGTON, January, '63.—Left camp at Falmouth, with some wounded, a few days since, and came here by Aquia Creek railroad, and so on Government steamer up the Potomac. Many wounded were with us on the cars and boat. The cars were just common platform ones. The railroad journey of ten or twelve miles was made mostly before sunrise. The soldiers guarding the road came out from their tents or shebangs of bushes with rumpled hair and half-awake look. Those on duty were walking their posts, some on banks over us, others down far below the level of the track. I saw large cavalry camps off the road. At Aquia Creek landing were numbers of wounded going North. While I waited some three hours, I went around among them. Several wanted word sent home to parents, brothers, wives, &c., which I did for them, (by mail the next day from Washington.) On the boat I had my hands full. One poor fellow died going up. I am now remaining in and around Washington, daily visiting the hospitals. Am much in Patent Office, Eighth street, H street, Armory Square and others. Am now able to do a little good, having money, (as almoner of others home,) and getting experience........To-day, Sunday afternoon and till nine in the evening, visited Campbell Hospital; attended specially to one case in Ward 1; very sick with pleurisy and typhoid fever; young man, farmer's son, D. F. Russell, Company E, Sixtieth New York; downhearted and feeble; a long time before he would take any interest; wrote a letter home to his mother, in Malone, Franklin County, N. Y., at his request; gave him some fruit and one or two other gifts; envelop'd and directed his letter, &c. Then went thoroughly through Ward 6; observ'd every case in the Ward, without, I think, missing one; gave perhaps from twenty to thirty persons, each one some little gift, such as oranges, apples, sweet crackers, figs, &c.
Evening, same day, went to see D. F. R., before alluded to; found him remarkably changed for the better; up and dress'd—quite a triumph; he afterwards got well, and went back to his regiment.........Distributed in the Wards a quantity of note-paper, and forty or fifty stamp'd envelopes, of which I had recruited my stock, and the men were much in need. “Too old to carry arms and fight like the others,” Zbigniew Herbert writes in “Report from a Besieged City,” a critical poem from the period of Solidarity in Poland, “they graciously gave me the inferior role of chronicler/ I record—I don’t know for whom—the history of the siege.” This was the position that Whitman found himself in at the start of the Civil War, and in these excerpts from Memoranda During the War we see him discovering his wartime vocation—ministering to wounded and dying soldiers from the North and South alike, dispensing gifts, making a record of his encounters. “Am now able to do a little good,” he wrote of his daily visits to Washington area hospitals, where “the men were much in need,” and in his new role as almoner to them, distributing money and food, note-paper and stamped envelopes, he also documented the consequences of war, gaining the experience necessary to write about it in an original fashion. “The real war will never get in the books,” Whitman wrote, though in fact he chronicled a sizable portion of it with an exacting eye. It is in the nature of literature to suggest the contours of an event, to engage the reader’s imagination in an approximation of reality—which is, of course, no substitute for what happened on the battlefield, in the hospital wards, or anywhere else; absolute fidelity to the emotional, physical, political, social, or spiritual dimensions of any moment in time is impossible, particularly when it concerns events of civilizational importance, like the Civil War; hence the number of books on the subject still being published a hundred and fifty years later. It remains a rich lode to mine for poets and writers, historians and scholars, as Whitman himself may have foreseen. “Each line, each scrawl, each memorandum, has its history,” he wrote of the notes he compiled, some of them stained with blood. “Some pang of anguish—some tragedy, profounder than ever poet wrote. Out of them arise active and breathing forms”—the long dead who continue to nourish American literature, scholarship, and mythology. Sound and sight inspired in different ways the pair of crises—personal and political—that defined Whitman’s body of work. The musical imperative of his poetic breakthrough, the versets in “Song of Myself,” which in the run-up to the Civil War were designed to suggest the whole of the cosmos, gave way to images of carnage, which governed his voyage into the dark heart of America. The visual component of his writings during and after the war, rooted in the new art form of photography, proved to be as critical to the future of American literature as the cadences thrumming in the original edition of what became Leaves of Grass. He taught us how to hear and see afresh, for what he heard and saw among groups of soldiers huddled around campfires, on trains and boats, and in the hospitals, summon “myriad varied scenes of day or night—the graphic incidents of field or camp,” which forever changed the world. Most histories of wars focus on the battlefields—on the victors and the defeated, on ground gained and ground lost, on military tactics and maneuvers. When the wounded and dying are removed from the battlefields and sent to military hospitals, they tend to disappear from the histories of wars as we have come to know them. What are the implications of Whitman’s decision to focus his history of the war on the hospitals? How would we respond to and recall wars differently if our histories contained as much about the hospitals as about the battlefields? What would a history of a war be like if it told the entire story from the perspective of the soldiers in hospital wards?